Hobee’s customers now have a tasty new adult beverage to enjoy (responsibly. of course). 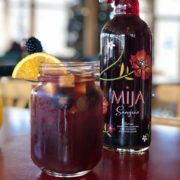 Mija Sangria is a fresh and natural bottled sangria made with 100% real unfiltered fruit juice for a true homemade taste. Mija is crafted without any artificial additives or preservatives. It is 100% gluten-free, and packed with antioxidants (3 times as many as a glass of red wine!) Mija Sangria is ready-to-drink (after you shake it for the best taste! ), and exceptional when poured over ice and mixed with fresh fruit. You’ve heard of the “veggie burger that bleeds,” now come taste what the buzz is all about! 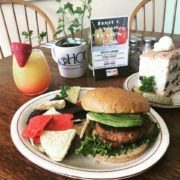 Hobee’s is now serving the Beyond Burger from Beyond Meat. Packed with 20 grams of plant based protein, this isn’t your grandma’s veggie burger. The revolutionary Beyond Burger looks, cooks and satisfies like beef but is 100% plant-based. The best part for Hobee’s customers is that the Beyond Burger will be 50% off every “Meatless Monday” through the end of the year! Bennies Get a Promotion: Now Served 7 Days a Week! Holy Hollandaise! You an now order Eggs Benedict seven days a week until 3:00 PM. Choose your favorite Bennie: Classic, Florentine, Salmon or Huevos Benedictos. We’re thrilled to give this weekend classic an upgrade to our regular menu. 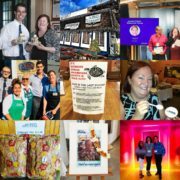 Bring on 2019: It’s Our 45th Anniversary! Happy New Year to all of our friends and fans around the world! (Pre-internet we used to say that jokingly, then years later our website logs showed us just how international we were!) 2019 marks Hobee’s 45th year in business. 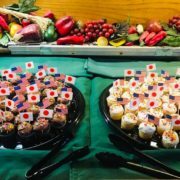 We plan on marking the milestone with special events, contests and food specials. Stay tuned as we move through this exciting year. And THANK YOU for supporting Hobee’s during the past four and a half decades! We have some outrageously good new menu items to share with you as we begin 2019. First, though they’re not technically new (they’re a staple weekend offering), Eggs Benedict is now offered seven days a week until 3:00 PM. 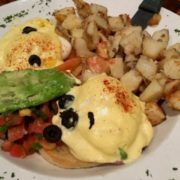 Choose from Classic, Florentine, Salmon or Huevos Benedictos. 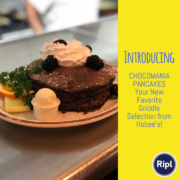 These are the items that are making their permanent menu debut: Chocomania Pancakes (chocolate cakes with chocolate chips, whipped cream and fruit); the El Camino Ommie (an egg white omelet with seasonal veggies, organic spinach, Jack and Cheddar cheese, topped with basil pesto); Sweet Potato Hash and Eggs (sweet potato hash with applewood smoked bacon, mushrooms, onion, zucchini, bleu cheese and a touch of maple syrup served with two farm-fresh eggs and blueberry coffeecake or toast); the Spartan Bowl (ancient grains, garlic roasted mushrooms, organic spinach, grilled artichoke hearts, mixed olives, red pepper, Feta cheese and basil balsamic drizzle); and Veggielicious Tacos (corn tortillas filled with black beans, sweet potato, roasted corn, goat cheese, and chipotle cream). Which will be your new favorite? 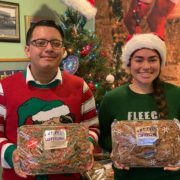 We wrap up the 2018 Holiday Season with this heartwarming update: We sold 571 coffeecake gift tins in December resulting in a $ 1713.00 contribution to Butte County Fire Relief. 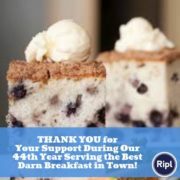 Thanks to everyone who supported our campaign! We must admit that we were somewhat surprised when the magic Instagram generator compiled our nine most popular posts from 2018 into a collage. Of the nine, only one was of food. (Coffeecake, naturally.) Another was our table tent about our “Straws Upon Request” campaign. Yet another was a trippy distorted image of Hobee’s Palo Alto’s exterior. The rest were all of people who make Hobee’s special: late owner Peter Taber and his surviving spouse and former owner, Edward Fike; current CEO Camille Chijate and co-owner husband Daniel; and our Montague crew with San Francisco 49er quarterback Jimmy Garoppolo. 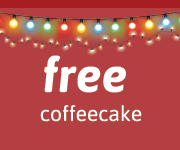 Our Holiday Gift to You: Free Coffeecake! Who doesn’t want FREE coffeecake? 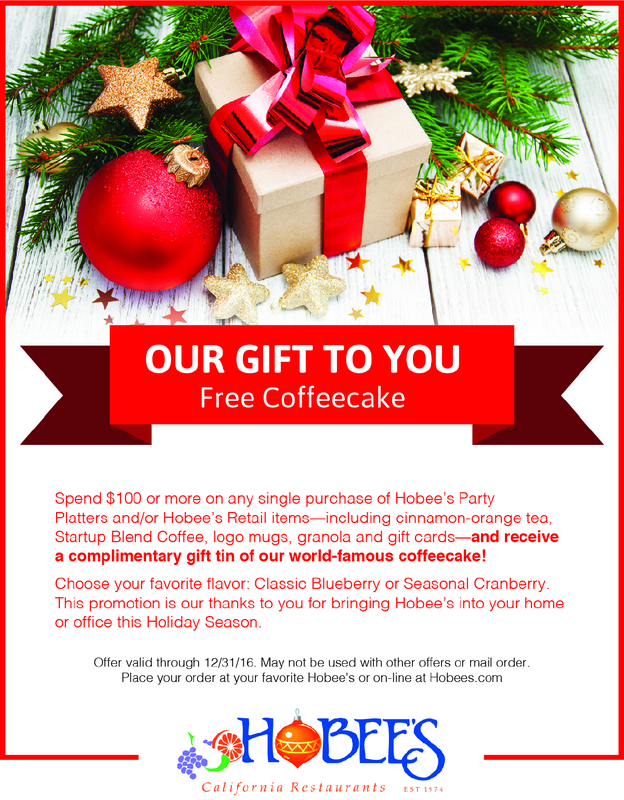 Thru the end of the year, we’re giving a free coffeecake gift tin with any purchase of $ 100 or more of Hobee’s party platters or retail items like tea, granola, logo mugs or gift cards. 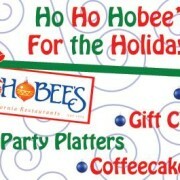 Order at your favorite location or at https://hobees.com/retail-orders Not valid with other offers, mail orders, third party delivery service orders or at Hobee’s Cupertino, an independently owned franchise. This is our gift to you for bringing Ho Ho Hobee’s into your home or office this Holiday Season! Don’t forget to add Hobee’s to your gift list this Holiday Season. We have something for everyone, including: t-shirts, logo mugs, Startup Blend Coffee our Signature Cinnamon-Orange Tea and – of course! – gift tins of our world-famous coffeecake. Can’t decide? A Hobee’s gift card is always an excellent choice.